A healthy smile during orthodontic treatment. Most patients think that getting “braces” is only about straight teeth and a nicer smile. 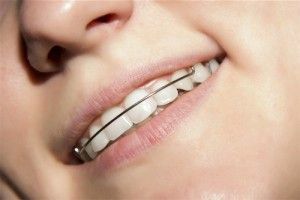 Treatment with braces corrects the proper position of the teeth and protects against excessive wear and tear found when teeth are in the wrong position. So braces create not only a nicer smile, but better function and contribute to greater overall dental health. Many general dentists practice orthodontics, though complicated cases are usually treated by a specialist who has received a master’s degree in orthodontics: 2-4 additional years of education beyond dental school, depending on the program. The straightening of your teeth can involve anything from simple, minor tooth movement to complicated tooth movement and surgery. Tooth movement takes place when force is applied to a tooth that breaks down bone in the direction of the movement and builds up bone on the other side of your tooth. Surgery can realign and improve the relationship of the upper and lower jaw. The proper relationship between your upper and lower teeth helps determine how well you can chew food without excessive wear and tear to the teeth. Since digestion of food begins in your mouth, proper alignment of your teeth plays an important role in overall health. Movement with a retainer: For minor tooth movement that will not affect any other teeth. This treatment is predominately done to make simple changes to one or two teeth. 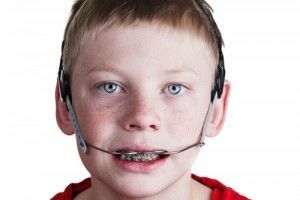 A type of headgear used in treatment with braces. 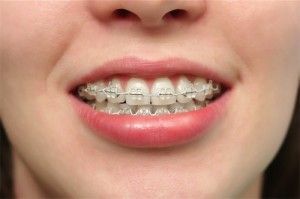 Invisible braces: Consist of a series of clear trays that are worn continuously with the exception of when you clean your teeth and during meals. There are “buttons,” or bumps, of composite filling material that are bonded to various places on your teeth (and removed at the end of treatment) to help create the force needed to move your teeth when the trays are worn. 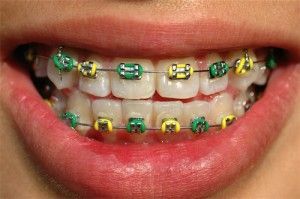 Young patient with colorful “bracket ties” that can be changed with the seasons, high school colors or holidays! “Invisible” braces appear as clear plastic trays. There are removable plastic “bumps” placed on teeth and the tray places force on the “bumps” and moves the teeth in the desired direction. Conventional “braces”. Note the pink, healthy gum tissue, indicating great home care. The treatments above can also involve a process called “stripping,” a process of creating space where your teeth are crowded. It is done by removing a fraction of enamel from both sides of your tooth or teeth to create space for aligning your teeth. This process is dependent on the thickness of your enamel, which is different for everyone. How do you know what kind of treatment is necessary? Patients who are referred to an orthodontic office often have an initial visit, as a type of consultation that allows both the patient and the orthodontist to discuss expectations, risks, benefits, and alternatives. Most orthodontists do not charge for this visit. x-rays of various types; treatment for children involves x-rays to determine growth patterns and adults to measure the relationship between the upper and lower jaws. NOTE: all decay and gum disease needs to be treated prior to beginning orthodontic treatment. What are the different kinds of orthodontic treatment? Initial retention phase: Once orthodontic treatment is complete and brackets are removed, there is a stage when the movement must be retained while the bone and ligaments around the teeth return to a stable state. The continuous use (except while eating, brushing or flossing) reduces the chance of relapse or tooth movement back to an undesirable position. This phase can last 2-3 years, depending on the orthodontist’s recommendations. Long-term retention: Today the retention is usually a permanent situation. 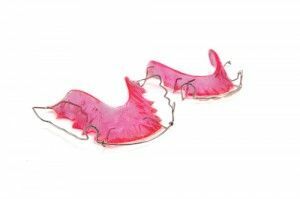 After the initial phase, patients are now encouraged to wear their retainer at night indefinitely. An orthodontic retainer used to hold teeth in place following treatment with braces. 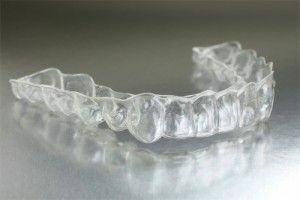 This is a clear plastic retainer; it looks similar to “invisible” braces, but there are no removable plastic “bumps” placed on the teeth. 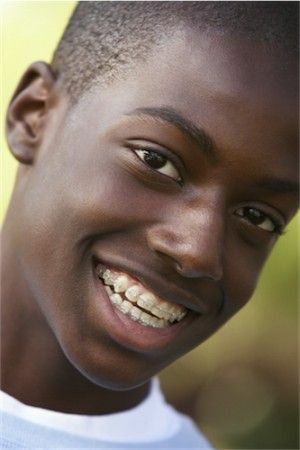 Another type of retainer used once “braces” are removed. Teeth move when any of a variety of devices are used to exert force on the teeth. One of the newer improvements to orthodontic treatment is the use of a computerized robot to bend the arch wires. When the arch wires are bent by a human, the desired movement occurs, but that movement is usually accompanied by an additional, undesired movement that then has to be corrected. When arch wires are bent by a computer, undesirable movement is diminished and orthodontic treatment is significantly shortened. What is jaw surgery and why is it necessary? Jaw surgery may be required when the upper and lower jaw develop into a less-than-desirable alignment. For example: An 18-year-old female with a history of a cross-bite in her baby tooth stage (when the individual bites together the back lower teeth are outside the upper teeth; the proper relationship is the lower teeth tucked inside the upper teeth) on only one side of her mouth. Because this was not corrected in childhood, the side of her jaw with the cross-bite grew longer than the opposite side. Furthermore, she was a tongue thruster (when she swallowed, she protruded her tongue out between her teeth) and her upper teeth touched her lower teeth on two back teeth only; none of her other teeth touched when she bit together. This patient required full mouth brackets/braces for 2.5 years, with her treatment finalized by both upper and lower jaw surgery. The surgical team tipped her upper jaw down in front and cut a section through her lower jaw and slid it back so that her jaw would be the same length from the middle of her chin back to her earlobes, right to left. 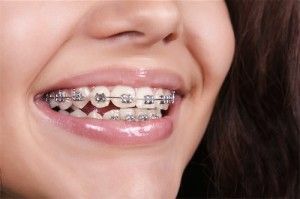 Some patients prefer clear plastic brackets instead of metal brackets because the “braces” are less noticeable. Probably the largest determination of success or failure of orthodontic treatment is patient cooperation. Do the patients make all of their scheduled appointments? Is their at home care well maintained? Are they wearing their headgear and/or rubber bands? Are they watching what they eat to avoid breaking brackets and arch wires? Are they seeing their regular dentist to prevent tooth decay and gum disease? These are the largest obstacles to the positive outcome of orthodontics. Commitment and cooperation are the keys to success in creating a beautiful smile and appropriate function through orthodontic treatment!